The Forty-fourth United States Congress was a meeting of the legislative branch of the United States federal government, consisting of the United States Senate and the United States House of Representatives. 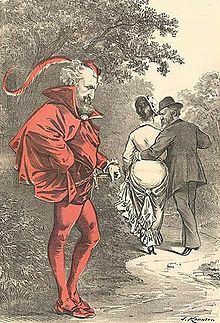 It met in Washington, D.C. from March 4, 1875, to March 4, 1877, during the seventh and eighth years of Ulysses S. Grant’s presidency. 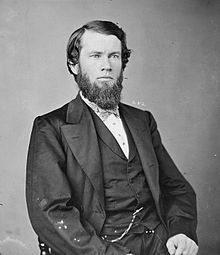 The apportionment of seats in the House of Representatives was based on the Ninth Census of the United States in 1870. For the first time since the American Civil War, the House had a Democratic majority. The Senate maintained a Republican majority. 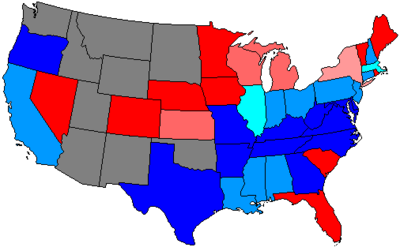 November 7, 1876: United States general elections, 1876, including the disputed Presidential election of 1876, later settled with the Compromise of 1877 which ended Reconstruction. 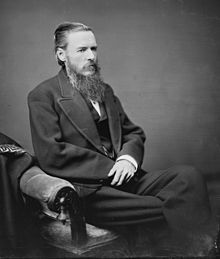 President: Henry Wilson (R), until November 22, 1875; vacant thereafter. Senators were elected by the state legislatures every two years, with one-third beginning new six-year terms with each Congress. Preceding the names in the list below are Senate class numbers, which indicate the cycle of their election. 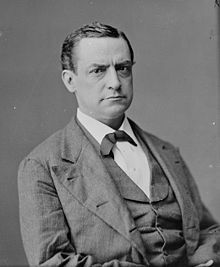 In this Congress, Class 1 meant their term began in this Congress, facing re-election in 1880; Class 2 meant their term ended in this Congress, facing re-election in 1876; and Class 3 meant their term began in the last Congress, facing re-election in 1878. Tennessee (1) Andrew Johnson (D) Died July 31, 1875. Connecticut (3) Orris S. Ferry (R) Died November 21, 1875. 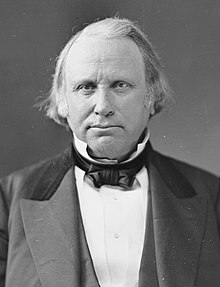 Connecticut (3) James E. English (D) Interim appointee retired May 17, 1876 when successor elected. Maine (2) Lot M. Morrill (R) Resigned July 7, 1876 to become U.S. Secretary of the Treasury. Successor appointed July 10, 1876, to continue the term. West Virginia (1) Allen T. Caperton (D) Died July 26, 1876. Colorado (2) New seat Colorado admitted to the Union August 1, 1876. Colorado (3) New seat Colorado admitted to the Union August 1, 1876. Tennessee (1) David M. Key (D) Interim appointee lost special election. West Virginia (1) Samuel Price (D) Interim appointee lost special election. Lists of committees and their party leaders, for members (House and Senate) of the committees and their assignments, go into the Official Congressional Directory at the bottom of the article and click on the link (5 links), in the directory after the pages of terms of service, you will see the committees of the Senate, House (Standing with Subcommittees, Select and Special) and Joint and after the committee pages, you will see the House/Senate committee assignments in the directory, on the committees section of the House and Senate in the Official Congressional Directory, the committee’s members on the first row on the left side shows the chairman of the committee and on the right side shows the ranking member of the committee. ^ Taft, George S. (1885). Compilation of Senate Election Cases from 1789 to 1885 – Pages 483 – 512. U.S. Government Publishing Office. Congressional Directory for the 44th Congress, 1st Session. Congressional Directory for the 44th Congress, 1st Session (1st Revision). Congressional Directory for the 44th Congress, 1st Session (2nd Revision). Congressional Directory for the 44th Congress, 2nd Session. Congressional Directory for the 44th Congress, 2nd Session (Revision).